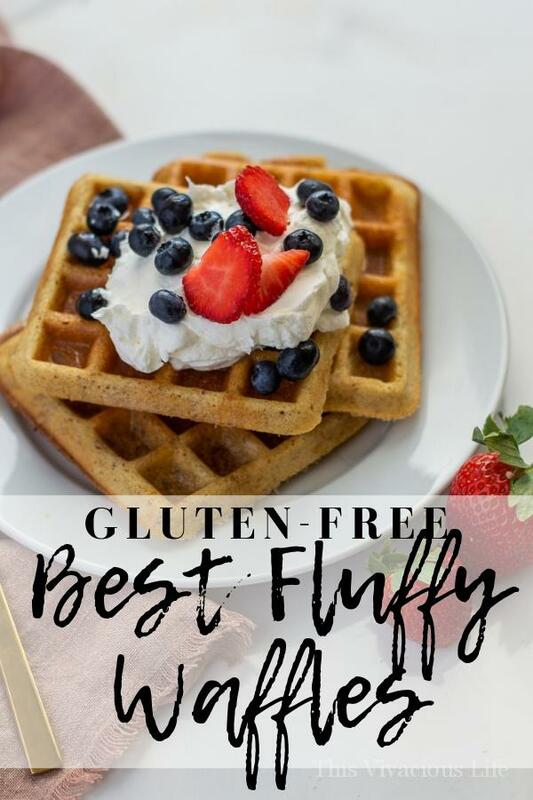 These are hands down the BEST gluten-free waffles! They are crispy on the outside and fluffy on the inside. Everyone will love how flavorful they are too. Using multiple gluten-free flours gives these the best flavor and texture of any waffle I’ve tasted. 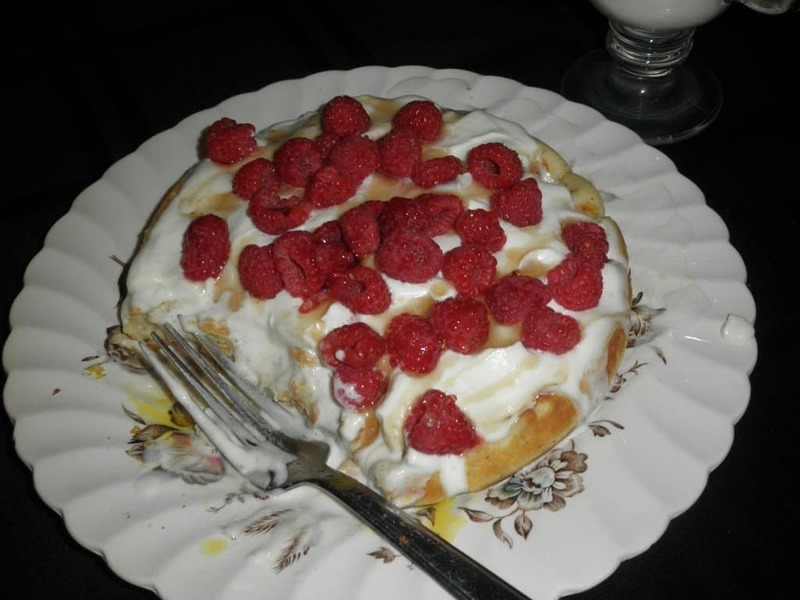 This is my mom’s 20 year old waffle recipe that we adapted after being diagnosed with celiac disease. 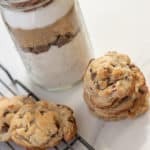 The perfect taste was achieved through much trial and error with varying amounts of gluten-free flours like almond, brown rice, tapioca starch and potato starch. 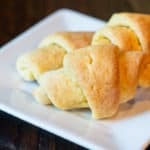 Can you use an all-purpose gluten-free flour to make these? 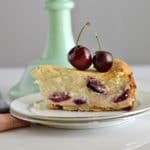 Yes you can use an all-purpose gluten-free flour, however the taste and texture may be different. 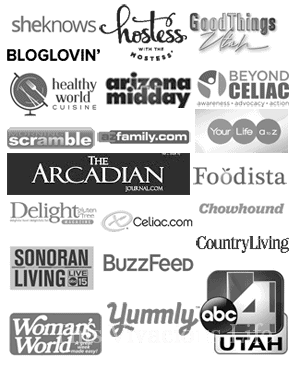 If you do choose that route, I recommend a high quality GF flour blend like King Arthur gluten-free flour or Pamela’s Baking and Pancake mix. 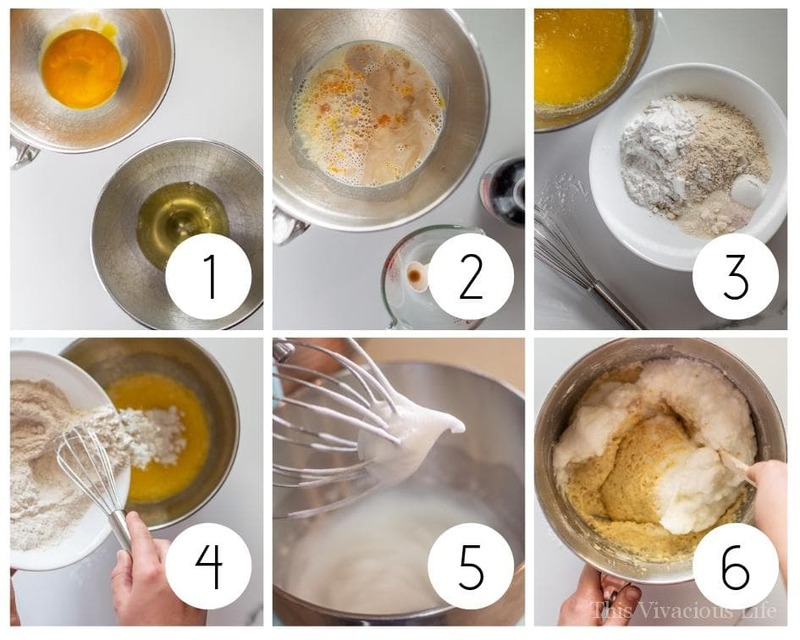 In two stand mixer bowls, separate the egg yolks and egg whites (as shown in photo 1). Mix milk, melted butter and vanilla into the egg yolks (as shown in photo 2). In another bowl, mix the dry ingredients (as shown in photo number 3). The 1/4 C sugar is totally optional. They are great with or without it. Next, slowly add dry to wet and mix until well blended (as shown in photo number 4). Whip egg whites until stiff (as shown in photo 5). Fold in stiff egg whites into the batter (as shown in photo 6). 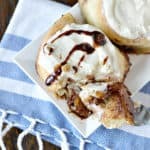 Cook the waffles by the scooping out 3/4 full large ice cream scoop into a preheated, greased waffle iron. You can make large Belgian waffles by using almost two scoops of batter. What waffle iron is best to use? While anything will work? I recommend using this Cuisinart stainless steel Belgian waffle maker if you are wanting big round waffles. 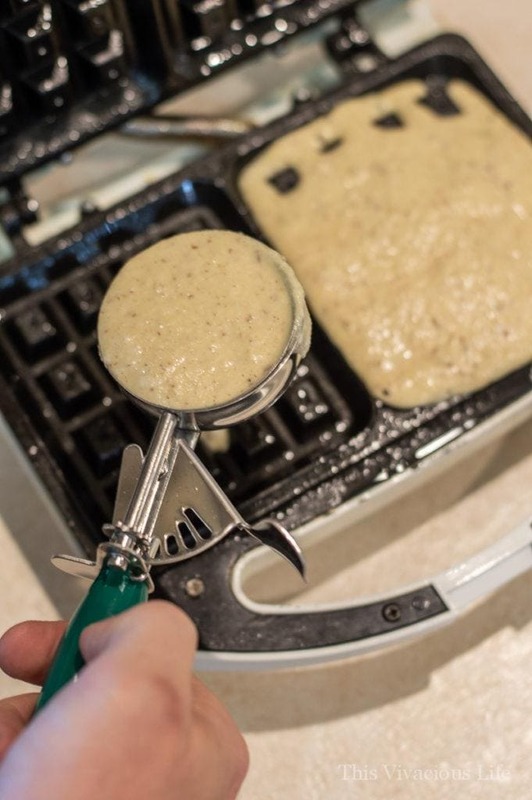 If you want square waffles, this Hamilton Beach waffle iron is great! Pro Tip: Whipping the egg whites first gives the waffles that fluffy texture that you love! It isn’t necessary but it sure does make them better. 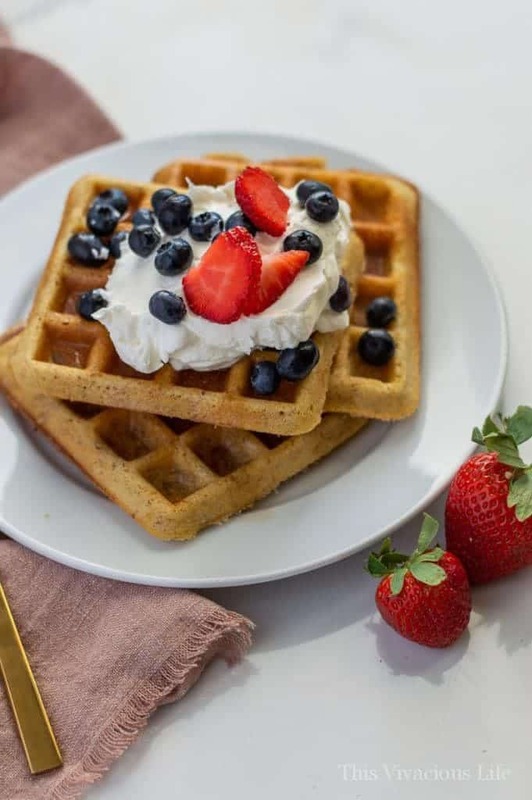 Leftover gluten-free waffles can be stored by placing them on a plate and covering them with tinfoil. They can be stored at room temperature for 1-2 days. 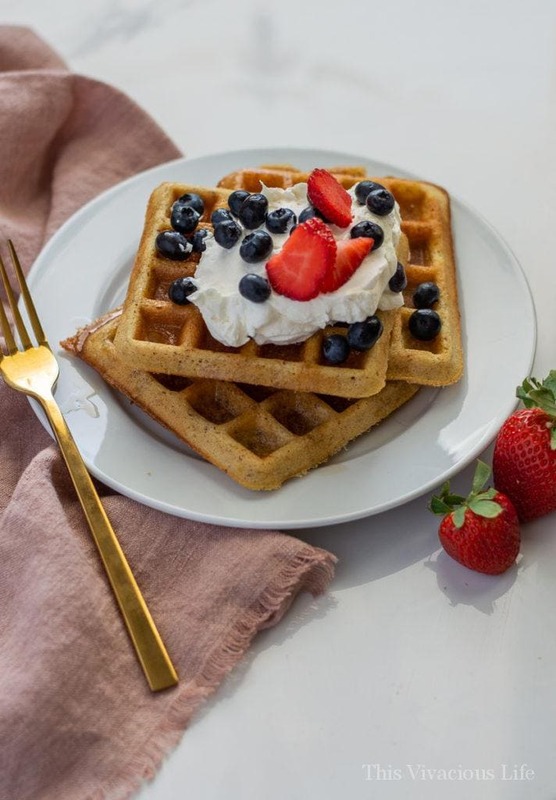 Can these gluten-free waffles be frozen? You can freeze them by wrapping cooled waffles in tinfoil then place them in gallon freezer bags. I like doing both so they don’t get freezer burnt. 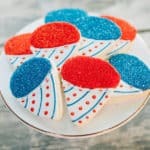 To enjoy from frozen, simply pull them out and either microwave until unthawed and warm (although they won’t be crispy) or use a toaster oven to unthaw and warm them at 250-300 degrees for about 10 minutes. Using a toaster oven keeps them crispy. If they are square waffles, you can also just pop them in the toaster. They may need two rounds in the toaster to get unthawed and warm. 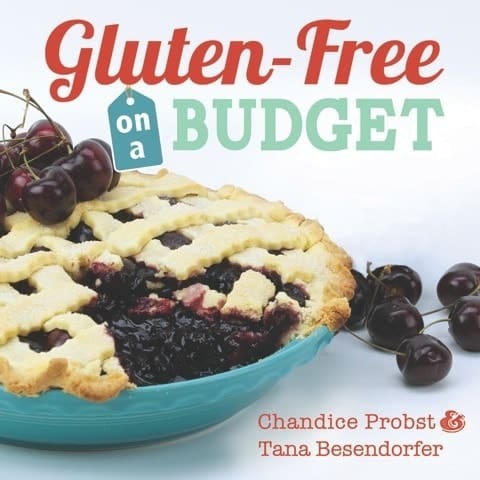 Also, you can find over 100 delicious gluten-free recipes like this in our cookbook, Gluten-Free on a Budget. 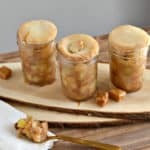 Even my mom’s coveted flaky pie crust recipe is even included! Get your copy HERE. 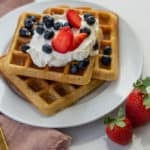 These are hands down the BEST gluten-free waffles! They are crispy on the outside and fluffy on the inside. Using multiple GF flours gives it the best flavor and texture. 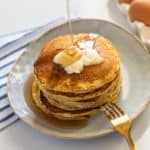 Everyone will love these for breakfast! I recommend using this Cuisinart stainless steel Belgian waffle maker if you are wanting big round waffles. If you want square waffles, this Hamilton Beach waffle iron is great! One of my favorite breakfasts! So filling and so good! 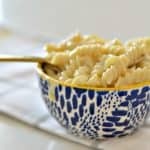 Love this recipe, thanks for sharing.